This work provides you with timely, useful, and practical information in short, direct, and easy-to-read articles. 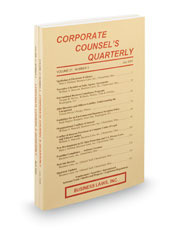 Some of the regular features include feature articles on timely subjects of interest to corporate counsel, seminar reports prepared by our editors, practical commentary on international law subjects, "bread-and-butter" commercial law articles, discussion of intellectual property subjects, commentary and materials on compliance;including actual compliance exercises. Issues also include company policy statements, corporate governance discussions and materials, checklists and forms, descriptions of useful web sites for corporate counsel, and a quarterly review of recent developments.